First off, I had a bookgasm reading this book. That’s wasn’t a word, but it is now. I’m pretty sure it’s going to catch on amongst the reading fanatic crowd. This book has an intricate blend of simplicity of concept and complex foundation of knowledge that will excite you and keep you turning those pages. Love. this. book. This book sources Positive Psychology and the Neuroscience of Coaching and talks about the technical workings of the brain in a language that is really easy to understand. I am certainly not a neuroscientist after reading this book, but I have an applicable understanding of what’s actually going on inside our heads. So now I know enough about my survivor brain and my middle pre-frontal cortex (MPFC) to be able to use that information in a constructive way. This knowledge literally helps me in my day to day and in my leadership. Do you love archetypes? The personification of personality or behaviour traits? Chamine has developed a 2 min assessment that will identify your particular brand of self-sabotage – and the specific key players in your mind. Forget “better the devil you know”. Move on to “get to know your devils so that you can take back control from them”. If you want to know who’s in the driving seat of your life, take this assessment. If you want to get back into the drivers seat, read this book (and book a free appointment with me – you don’t need to do this alone). PLUS you get the FIVE POWER TYPES. Once you’ve neutralised the enemy within, you need a force for good. And Chamine shows you five simple but powerful ways to access your own force for good. The bibliography alone is awesome! It’s a comprehensive collection of the most significant research and resources in the field – and it’s all in one place! So for those of you who like to cite the science, get this book. This book is full of so much good information AND it is still a light read. Chamine has really embraced storytelling and it works so well with these topics. These are also real stories of how he has used all of this content in real life. Want to access your true potential? Step 1: read this book. Step 2: discuss what you’ve learned with me. I would happily talk about this book every day and I want to hear what you think. You can find it on Amazon, Bol.com etc. 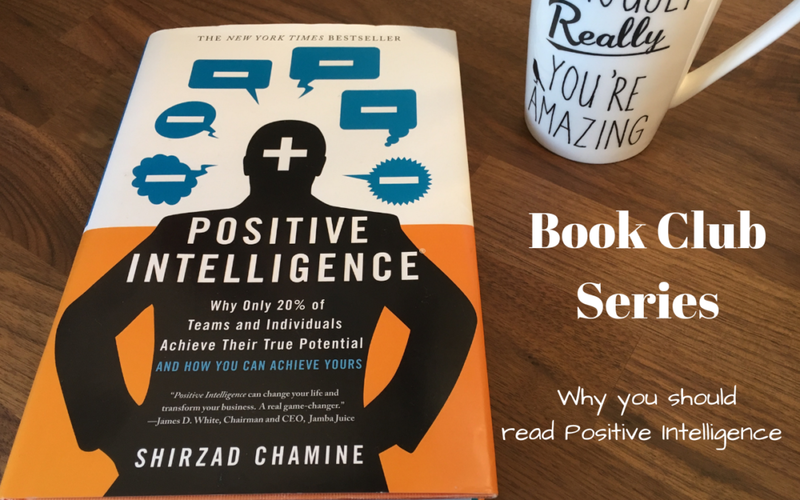 Just look for: Positive Intelligence by Shirzad Chamine. Would love to hear what you think so share in the comments. This post is part of my Book Club Series where I share what I’m reading with you. I’m highlighting the “oh my god, you’ve got to read this!” books. These are the ones that I’ve been recommending to clients, friends, and anyone I’ve spoken to while reading the book. I have even been known to buy extra copies and given them to people. These books are great.